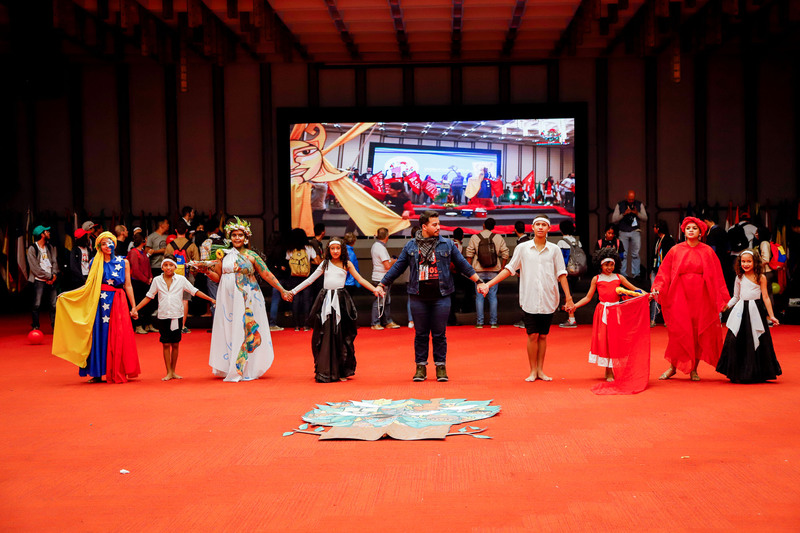 500 participants from 87 countries and 181 people’s movements and organizations participated in the International Peoples’ Assembly in Solidarity with the Bolivarian Revolution and Against Imperialism from February 24-27 in the Venezuelan capital, Caracas. On the final day, the Assembly gave a call for an International Day of Struggle for Peace in Venezuela and the cessation of the economic blockade to be observed on March 16. The four days of activities included panel discussions on the current imperialist offensive and the attacks on Venezuela, regional working group discussions which sought to propose an agenda of action and mobilization to strengthen each region’s solidarity with Venezuela. Acts of mística were performed daily, which brought to the forefront the diverse cultures, languages, songs and dances of the diverse space that is the International Assembly. On February 26, the participants separated into groups to visit different experiences and projects of the Bolivarian Revolution such as communes, worker-owned factories, community centers and housing projects. After the territorial visits, the constitutional president of the Bolivarian Republic of Venezuela, Nicolás Maduro, addressed the 500 participants at the Teresa Carreño Theater. Nicolás Maduro stands with Silvana Broggi of Argentina and Joao Pedro. Jhonn Zerpa | Presidencia de Venezuela | AFP Stedile of Brazil. Maduro said, “You all are in Caracas saying ‘here we are standing up, here we are in struggle, here we are in solidarity’. Thank you for your solidarity, thank you for your love, thank you for your perseverance”. 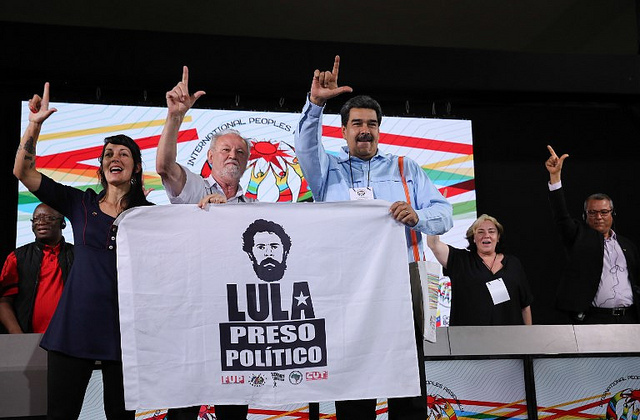 He also discussed the current imperialist attacks against his country that range from criminal economic sanctions to the Juan Guaidó’s unconstitutional claim to the presidency. He pointed out that, “The battle in Venezuela is not just for us. It is a battle for the right to independence, peace, world diversity, political, ideological and cultural diversity”. The solidarity encounter concluded on February 27 and the day’s mística was dedicated to the popular uprising against neoliberalism in Caracas exactly 30 years ago. The violent repression of the uprising resulted in the deaths of hundreds. Representatives from the five continents participating in the Assembly spoke at the concluding panel. They read the closing statements which included a Letter of Solidarity with the Peoples in Struggle, the Closing Statement from the Che Guevara Internationalist Brigade, a Manifesto in Solidarity with Venezuela, and the launch of a campaign for Peace and Sovereignty in Venezuela. In the manifesto, the delegates declared that in “defense of the sovereignty and self-determination of Venezuela, we pronounce ourselves in defense of the Bolivarian Revolution and the legitimate and constitutional President, Nicolás Maduro.” They also denounced the war-mongering attitude of the United States which seeks to spark military confrontation and foreign intervention through a supposed concern for human rights and democracy. “The peoples of the world want peace; we do not want another war” it read. The delegates will be returning to their home countries in the next few days, where they will continue their struggles daily for basic rights like education, health, housing, engage in struggles to defend their territories from imperialist aggression manifested by transnational companies that seek to exploit their countries natural resources, and fight against governments which every day take more and more of their rights away. Many participants expressed that in addition to the importance of standing in solidarity with Venezuela, the assembly allowed them to experience the possibility that an alternative is possible, that it is possible for a government to meet the basic needs of its people, to live in harmony, to organize, to fight and to achieve a better future. Despite the latest attempts by the US government and its allies to cause crisis in Venezuela through their harsh economic sanctions and finally the outright attempt to install a government and overthrow Nicolás Maduro, it is clear that they are not yet satisfied, and these attacks could intensify. However, what is clear from the Assembly is that the people of the world, the working class organizations, trade unions, political parties, peasant organizations and more stand firmly with Venezuela. Hey Buddy!, I found this information for you: "International Peoples’ Assembly gives clarion call for solidarity with Venezuela". Here is the website link: https://peoplesdispatch.org/2019/02/28/international-peoples-assembly-gives-clarion-call-for-solidarity-with-venezuela/. Thank you.